2-day guided Wyoming antelope hunt with meals, lodging and trophy care. Click here for details on our Wyoming antelope hunt. The pronghorn antelope is truly one of the most unique big game species on the North American continent. With eyesight equal to the finest optics and capable of speeds up to sixty miles per hour, the pronghorn antelope ~ "the prairie ghost" ~ offers plenty of enjoyable hunting opportunity. Pronghorn antelope numbers exceed the human population in Wyoming and several other western states also support excellent antelope populations. A handsome pronghorn buck is a must for your trophy room. Call us for and we will help you plan your pronghorn hunt. 2-day guided hunt for New Mexico trophy antelope with meals, lodging and trophy care. 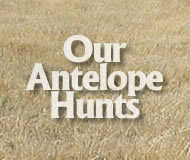 Email or call us for more information on our New Mexico antelope hunting. 2-day guided Wyoming pronghorn antelope hunt with meals, lodging and trophy care. 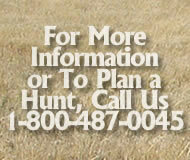 Email or call us for more information on this hunt.